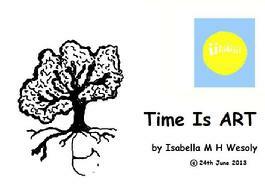 The 'Time Is ART' series was launched on 26th July 2013 with an E-book by Isabella Wesoly, entitled Ways of Seeing. The title was inspired in part by a book of the same title by John Berger, whilst the presentation found its inspiration in another book called Way of The Soul by William T. Horton. The content within this electronic book itself has taken all of it's inspiration from Isabella Wesoly's different perspectives on life. Originally twenty four pages of expressionist, abstract and cartoon-type visual images, married up with meanings, associations or sentiments. 'Ways of Seeing' is now available on YouTube, with just 5 images.. 51 seonds worth of wonder; more via the pause button. Perspectives on life are not always the same amongst all cultures, but in Isabella's opinion, a different view of anything is always worth pursuing and time is always ART.